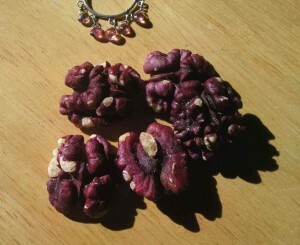 Livermore red walnuts grown here in California are a striking shade of magenta, as well as being delicious. I love going to farmer’s markets. Even if my refrigerator is full, I love their energy and the chance discoveries. My latest revelation is the Red Walnut – a really purplish, magenta colored version of the familiar tan nut. The ones I bought were fresh from Terra Bella Ranch in northern San Diego County, so they had a wonderful light and sweet nutty flavor. But what really sold me was the color. A little sign explained that the nuts are the Livermore variety and said they hailed from England originally. But I did some research and tracked down the US Patent application that was filed by the University of California at Davis, where the Robert Livermore walnut was developed. The Livermore is a cross between a purple walnut variety and the standard Howard walnut. Robert Livermore was a supporter of the university’s programs and with having the unusual new walnut named for him. Check out Terra Bella Ranch’s Facebook page to learn where to find them. Or if you live in a climate where walnut trees thrive, you can order your own Livermore red walnut tree from Dave Wilson Nursery. Since most of the good phenolic acids, tannins and flavonoids in a walnut is in the skin or pellicule, it’s not hard to believe that the red walnut has some unique nutrients that aren’t found in the tan walnut. According to the walnut entry on World’s Healthiest Foods, Walnuts are a great source of gamma-tocopherol, a rather rare form of Vitamin E that has been shown to have very positive role in reducing heart disease risk. With that and other beneficial properties, is why I’m naming walnuts the sweet-heart nut of Valentine’s Day. In case you’re wondering what to do with walnuts besides eat them, I’ve put together a collection of delicious walnut recipes on Foodily.